Peggy George: did any of you get to see this presentation by David Lankes called Focus on Connection management and not collection management-he made excellent points related to connecting with people and content and curriculum! And just a reminder, We’ll be gathering more guests on the 4th Tuesday each month at 4:00 PM. 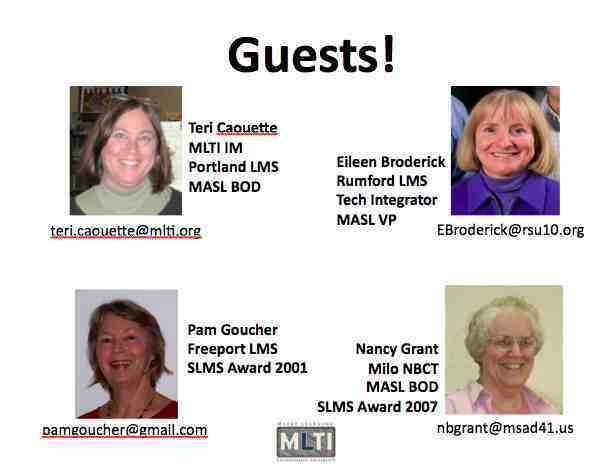 We are in the process of planning out the MLTI principals’ webinar topics for the remainder of the year. If you have a topic or two that you think should be taken up just let me know! You can respond by commenting below, or email me at christoy.net@gmail.com. I hope principals make a point of gathering their leadership teams and/or staffs to join in on these conversations, Because as we know, when it comes to school improvement…It’s all about leadership! This entry was posted on October 30, 2010 at 5:32 pm and is filed under Leadership. You can follow any responses to this entry through the RSS 2.0 feed. You can leave a response, or trackback from your own site.